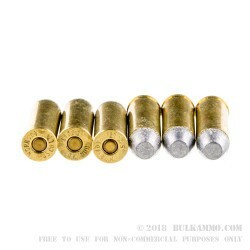 While the .45 ACP is renowned for its sheer size and power, it pales in comparison to the power and velocity of the of the original .45 long colt round. 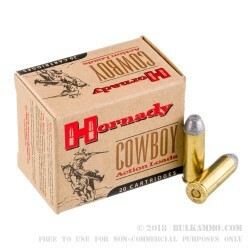 The Hornady 255 grain .45 Long Colt Lead Flat Nose ammunition is the modern day iteration of this true wild west classic, and guaranteed to exceed your wildest expectations. 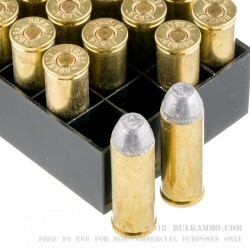 The massive 255gr lead flat nose round travels at an average muzzle velocity over 975 feet per second, and is ideal for cowboy action, and single action revolver shooting. Subsonic velocities make of easy recoil recovery when shooting single handed, and are engineered to give you on edge on the range, and during competition. Precision measured propellants make for consistent point of aim, point of impact regardless of lot or date of manufacture, and are great for shooting at steel targets due to leads ability to flatten and expand rather than fragment upon impact with hard surfaces. 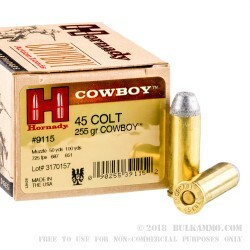 Cowboy action shooters looking to relive the values and traditions of the wild west will find no better round than the Hornady 255 gr. 45 LC Lead Flat Nose.